I totally agree- leave early in the morning, not at night. Camping will be fine at Bowen Ranch. 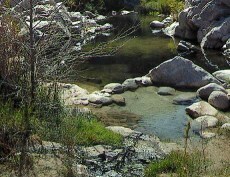 Also, there is a good hike on the trail that leaves the hot springs and parallels the creek. Also, take plenty of water and sunscreen. Enjoy!